Have you ever touched pond water and watched hundreds of little larvae squiggle around in the water? These are mosquitoes-in-waiting and although harmless at this stage, they quickly turn into flying bloodsuckers. Watch out, they are on the list of the top ten killers in the world, with over two million deaths a year! You won't die from their bite; however, they carry diseases that is transferred to humans when they bite. In the Northwest the mosquitoes can carry the West Nile Virus. 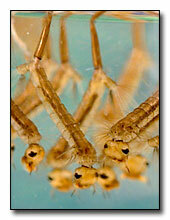 It’s mosquito larvae time, so arm your water features with an environmentally friendly Bt doughnut. The organic control is harmless to everyone—unless you are a ‘squito. Summit 20-Pack Mosquito Dunk. .